6 Books You Must Read! Happy Friday everyone! One of the things I looked forward to most when I graduated law school was reading a book for fun. I've spent (pretty much) the last 25 years of my life in school reading because I had too. One of my favorite things is curling up on the couch with a good book and getting lost in a different world. Now that I'm out of law school, living life in the working world, reading for fun has become such a fun hobby for me. My goal is to read at least 2 books a month. I know that doesn't seem like a lot, but hey, I'm trying! I usually have a book with me in my bag just in case I get stuck somewhere! Plus, I've found that reading a chapter or two before bed is the best way to wind down before bed. I challenge you to try it. Instead of going through Instagram right before bed, which I'm totally guilty of, put your phone on do not disturb, grab your book and I guarantee you'll see a difference in your sleep. To give you a little jump start, I thought I'd give you some book recs that I loved, hoping you'll love them too! I've read all of these so they're coming off a personal guarantee! Have you read any of these? What are your favorite books? Disclaimer: I read books that are light, entertaining, mystery, love story based. I spend my whole day reading case law and "real" life that I love books that are easy to read and easy to get lost in. I realize there are tons of people who don't enjoy this type of book and instead enjoy non-fiction (hence why I put #3 on here!) so hey, maybe next time I'll have some other kinds of books on here! Alright without further ado. American Wife by Curtis Sittenfeld: "A kind, booking only child born in the 1940's, Alice Lindgren has no idea that one day she will end up in the White House, married to the President. My favorite line from the synopsis and a huge reason I loved this book, "She discovers that she is married to a man she both love an fundamentally disagrees with." Go get this book. The Paris Wife by Paua Mclain:"Chicago, 1920: Hadley Richardson is a quiet twenty-eight-year-old who has all but given up on love and happiness - until she meets (and marries) Ernest Hemingway." I'm not going to lie, this book was a little slow to start. I had to force myself to get through the first few chapters, but once I started I was hooked. Killing Patton by Bill O'Reilly: General George S. Patton, Jr. died under mysterious circumstances in the months following the end of WWII." Go buy this book and all Bill O'Reilly's other books. They're engaging, interesting and such a great take on history. 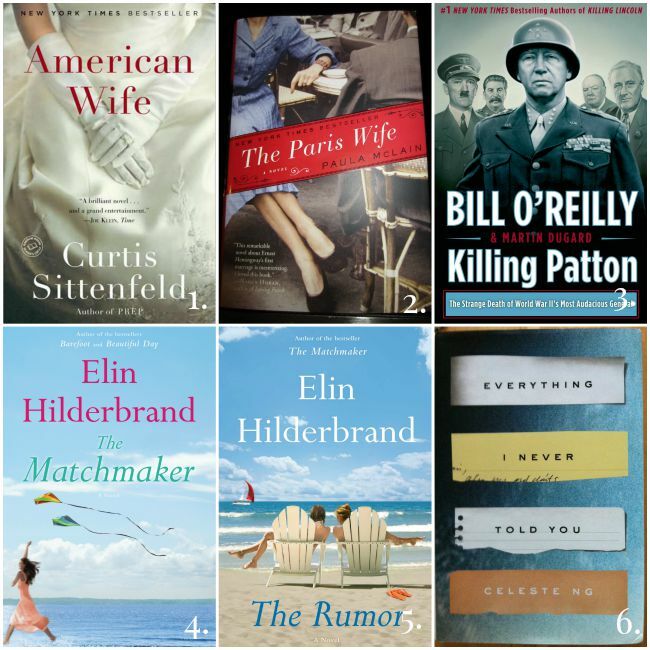 The Matchmaker by Elin Hildebrand: "48 year old Nantucketer Dabne Kimball Beech has always had a gift for matchmaking." I know what you're thinking, this is so cheesy. I read this book 2 days and I cried when it ended. So good. The Rumor by Elin Hildenbrand: "Madeline King and Grace Pancik are the best of friends of the envy of Nantucket for their perfect marriages, beautiful kids and their Sunday night double dates with their devoted husbands." Another Elin, yes I know. The thing I love about her books is that they're so easy to read , they're SO good and they're all based in Nantucket. Once you've read one, you'll want to read all the rest. Everything I Never Told You by Celeste Ng: "Lydia is dead." THIS BOOK. It's a mystery surrounding the death of this family's young daughter. It will keep you guessing until the very end. PS. Today is my fabulous mother-in-law, Jane's birthday. I am so lucky I got to marry Adam, but I am even luckier because of his amazing family. Jane has treated me as a daughter since the day I met her and made marrying into a large family so easy. I am so lucky to have her and my entire new family. Jane, Happy Birthday! I wish we were there to celebrate with you today because you deserve it! 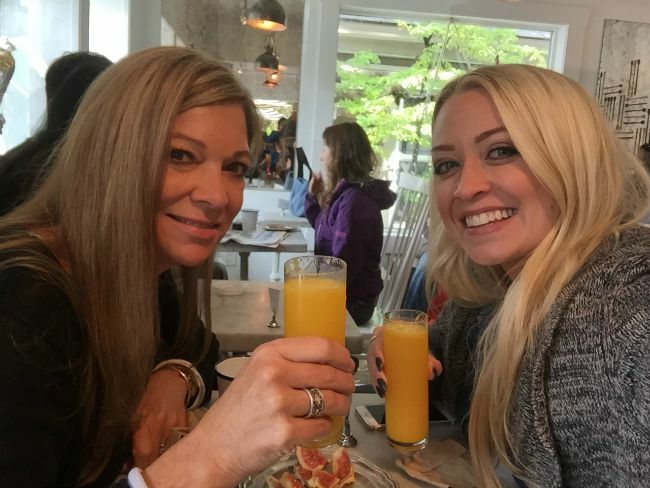 I wish we were brunching and drinking mimosas today! I hope you eat cake, drink wine, open presents and feel as special as you deserve! I love you! See you soon! The Paris Wife by Paua Mclain has been on my reading list (and book shelf) for far too long! I need to start reading it asap. I've only heard great things about it! 20 Things I'm loving right now + a birthday! Today is a huge day + a giveaway! September 11 - 14 years later.